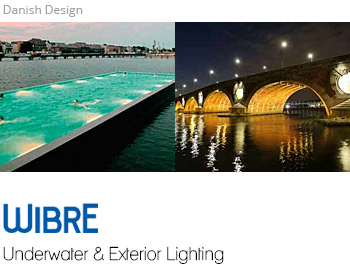 WIBRE presents a comprehensive lighting programme for underwater and exterior requirements. It consistently uses state-of-the art lighting technology such as LED. Wibre has a special department prepared to help its customers with one-off constructions as well as modifications in a relatively short construction time. The practical experience gained from this work flows into our production process and ensures a continual further development of our lighting technology. Our lights can be found in renowned objects working efficiently throughout the world in varied environments from Norway to the Arab Emirates and on to China.